I'm so sorry I'm so late getting this up ~ and it's been over a week since I posted at all! Life has been busy and my husband and I took off on a kid-less trip to Las Vegas for a few days. Needless to say, blogging took a back seat to all of that. I do have a book tour tomorrow so I will have a new review up in the morning. In the meantime, here's what I've been reading. I finished Off the Grid by Mark Young. It was a fun international thriller that I will review within the next few days. I also read Blue Asylum by Kathy Hepinstall, which is the book that I will be reviewing tomorrow for the tour. And I read a third book last week (that's what happens when you have two 4+ hour flights). 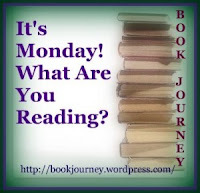 It was The Devil in the White City by Erik Larson. So, despite the fact that I didn't write anything here last week, I was actually productive with my reading at least! I'm going to start reading In My Father's Country by Saima Wahab tonight. It's been a while since I read a memoir, so I'm looking forward to it. After that, I'll be reading Darkroom by Joshua Graham.